Hello, everyone! As I said on Friday, today I'm entering the musical world again, and talking about one of my favorite Judy Garland films - "Meet Me in St. Louis." Did you get a chance to watch it yesterday on TCM? I hope so. This is one of the first films I recorded when I was a little girl after saving up my allowance and purchasing my very own VCR for the little television in my bedroom. And I still have that tape from some many years ago. It has been watched over and over and over again, but somehow it has lasted. I wanted to be Judy and dance around a Christmas tree. I got the chance in high school when my theater department did a production of "Meet Me in St. Louis." Sadly, I was just a chorus girl...but I still had fun. Released in November1944, it stars Garland, Margaret O'Brien, Tom Drake, and Mary Astor. Based on the personal, real-life stories of Sally Benson from her book 5135 Kensington, it follows a year in the life of the Smith family leading up to the World's Fair of 1904. 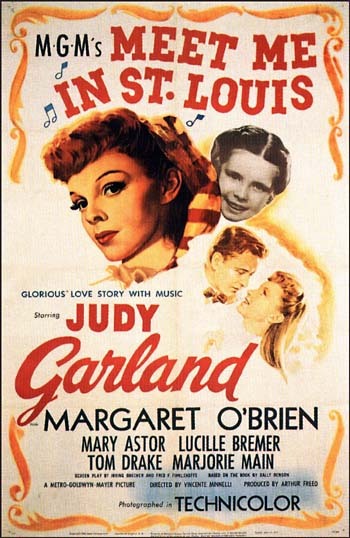 A sweet story of young love, casual days, and good old-fashioned family values, it epitomizes the classic MGM musical. Many consider this film as the one that kicked off MGM's golden age of musicals. 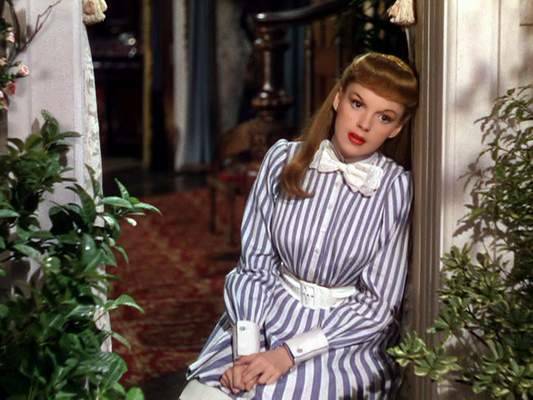 A smash hit, "Meet Me in St. Louis" was the second highest grossing film of the year (behind only Bing Crosby and "Going My Way"). 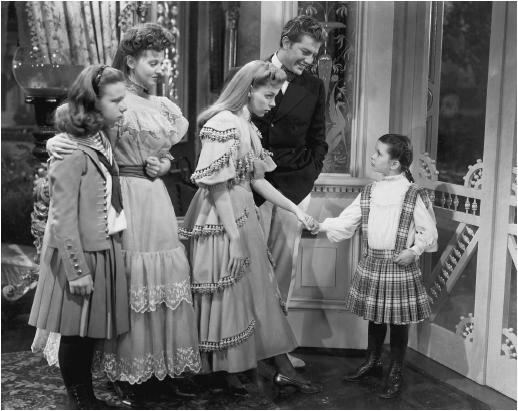 The studio was going to continue with more films about the Smith family, hoping for an "Andy Hardy" type series, but the sequel "Meet Me in Manhattan" never got beyond the planning phase. Of course, much of the film's success was due to Garland. Three of the films songs which she debuted ("The Boy Next Door," "The Trolley Song," and "Have Yourself a Merry Little Christmas") became hits on the charts, and have since become standards, like "Have Yourself a Merry Little Christmas" during the holidays. Garland had to be persuaded to do "Meet Me in St. Louis" though. Twenty-two at the time, she was tired of playing childhood roles and longed to move into the adult realm. Luckily, she was convinced otherwise, for this film is where she met future husband and director of "St. Louis" Vincente Minnelli. They fell in love during filming, married the following year, and then nine months later had little Liza. As Liza mentioned in the book Directed by Vincente Minnelli, "You can see his love for her in every frame." Garland once stated that she married Minnelli because he made her feel beautiful. Throughout her career afterwards, even after her divorce from Minnelli in 1951, she considered "Meet Me in St. Louis" her absolute favorite film. Another reason Garland was initially reluctant to do this film was Margaret O'Brien. Afraid she would completely steal the film, O'Brien still managed to steal practically every scene she was in. O'Brien plays the youngest Smith girl Tootie, the character that was writer Sally Benson in real life. (Her entire family called her by the nickname "Tootie.") O'Brien almost lost out on her most famous part, though. 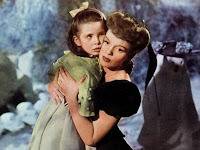 Her mother asked for too much money for the youngster, so the studio cast a lighting technician’s young daughter instead. Later, the studio changed their mind and cast O'Brien instead. The lighting tech, however, was working on "Meet Me in St. Louis" and purposely dropped a lamp during one of little Margaret's scenes, barely missing her. He was carted off and sent to a mental hospital for the incident. 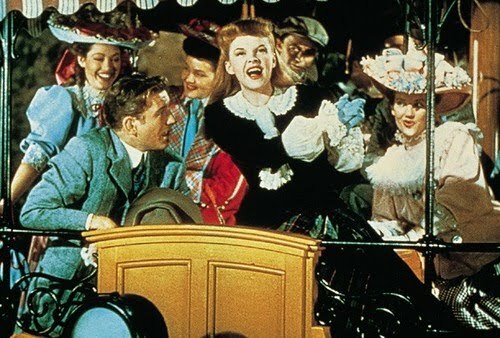 The film was nominated for four Academy Awards - Best Color Cinematography, Best Screenplay, Best Score, and Best Song for "The Trolley Song." The only award that was taken home that night, though, was a special juvenile award for Margaret O'Brien. Sadly I think, my favorite song "Have Yourself a Merry Little Christmas" was not nominated. The song was originally a little darker than we know it now. The original line was "Have yourself a merry little Christmas / it may be your last" in reference to all the soldiers fighting in World War II at the time of the film's release. However, Garland thought the line was too cruel to sing to little O'Brien and refused to say it. Even though the studio did not continue the Smith series of films, a television version was done in 1959 starring Jane Powell, Patty Duke, and Myrna Loy. A weekly non-musical television series was even produced in 1966 starring Shelley Fabares and Celeste Holm, but no network would pick it up. And if you are saying to yourself, "Wait! There was that Broadway version, right?," you are right. It ran for a little less than year in 1989 and received a few Tony nominations too. So, if you didn't get the chance yesterday, or if you just have to watch it again, gather the family together and watch "Meet Me in St. Louis" this week. Your heart will thank you. Have a good week, everyone! Be back Friday. Meet Me In St Louis is one of my favourite musicals! I love all the seasons, especially, Autumn and Winter. I love the Halloween scene and the Christmas dance scene. Love all the songs, 'Have Yourself A Merry Christmas.' 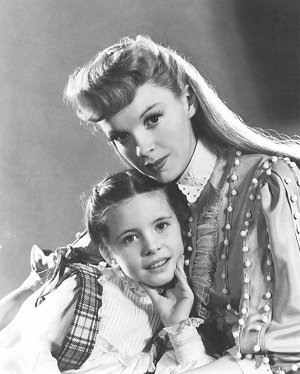 is lovely and Judy Garland had an amazing voice! I watch this film every Christmas Eve and it makes me feel warm and cosy! Do you feel your cell phone ringtone is boring? Want to own a unique ringtone on your phone? I think you will need my ringtones. Free ringtones for everyone in the world. You hear and feel and leave comments. For the Weekend: Hello, Mr. Newman!